iPal is a wearable computer with eye tracking and eye gesture control. Answer a call or take a picture hands-free. iPal is a wearable computer, in the form of a fashionable yet minimal pair of glasses, that allows people with disabilities hands-free control of their mobile devices using eye gestures. iPal has 4 cameras embedded into the frame, two micro cameras that track your eyes and two scene cameras that can view the world like human eyes and take photos and videos of exactly what your eyes see without lifting a finger. iPal has a microphone and speaker which can be utilized hands-free to answer a or place a call. iPal is powered through a separate control module that houses the battery, memory, processor and Bluetooth and WiFi. This allows us to make the eyewear as thin and lightweight as possible. The control module connects to the glasses via wires. The control module also communicates wirelessly with your Android, iOS or Windows smartphones. Among the numerous uses for persons with disabilities the specific exemplar’s: Xian had the expressed the need to be able to answer and utilize her phone while walking without having to first find a place to safely stop, balance ski poles and locate her telephone. iPal will enable hands-free control of her smartphone – answering and placing a call without having to take the time to stop. She will also be able to take a picture or record a video of what her eyes see without having to even touch her phone. With eye gestures, she will also be able to upload those to her favorite social networking site. Xian thought iPal was a Godsend device. Jason has challenges utilizing his hands and we foresee a number of assistive hands-free applications which could empower him in his everyday life. A few examples are controlling his computer using eye gestures (as one would using a mouse), the possibility to control his scooter, or other applications or equipment with his eyes via proper apps. Jason’s comment to those applications was "Controlling his mouse would be great, the controller for my wheelchair would be a priority, I'm really excited to see what you would come up with." In addition to helping those with mobility issues iPal can be utilized to help people with other types of disabilities such as limited sight or blindness. For instance there is already an app called Be My Eyes which allows a blind person to use a phone to connect with a live person for navigation or checking everyday things like instructions or expiration dates. http://www.bemyeyes.org/# But this app requires a user to hold a smartphone and point in a direction of interest. 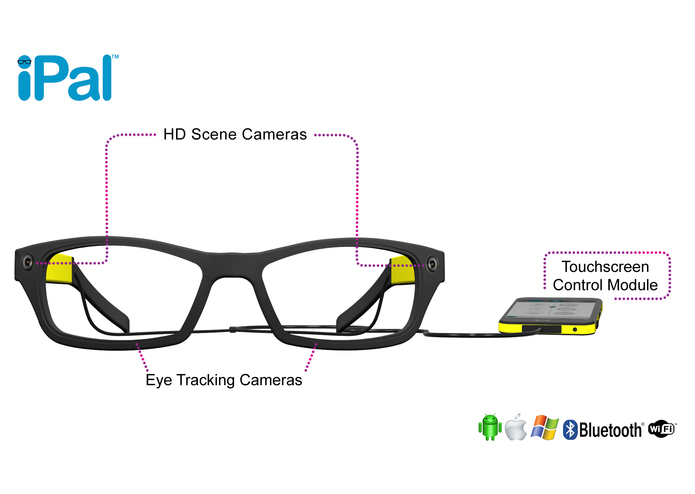 With iPal, a remote helper can see everything within the field of view of the wearer. iPal can also give a much needed pair of eyes to GPS devices to calculate distances from nearby objects and provide directional orientation. Additionally, with the already available object recognition apps such as Camfind or Google Goggles, iPal will be able to identify objects. iPal would also gives sight to the over 1 billion virtual personal digital assistants such as Siri (iPhone), Galaxy (Samsung), Google Now (Android) and Cortana (Windows). Part of the business development team at i2i inc., a wearable hardware startup focused on eye tracking technology. iPal can help visually impaired people too. In this YouTube video, Rachel Wilkinson a speech therapist talks about iPal for children with special needs.